BMW, the renowned German luxury automotive marque, has revealed the first impressions of it’s much hyped X4 Concept Sports Activity Vehicle (SAV), just days ahead of the Shanghai Motor Show. The initial pictures indicate that the BMW X4 Concept could perhaps be the company’s most stylish crossover model till date. The futuristic SAV is expected to be unveiled in front of the global auto industry at the Shanghai Motor Show, which is to be held in the last week of April 2013. 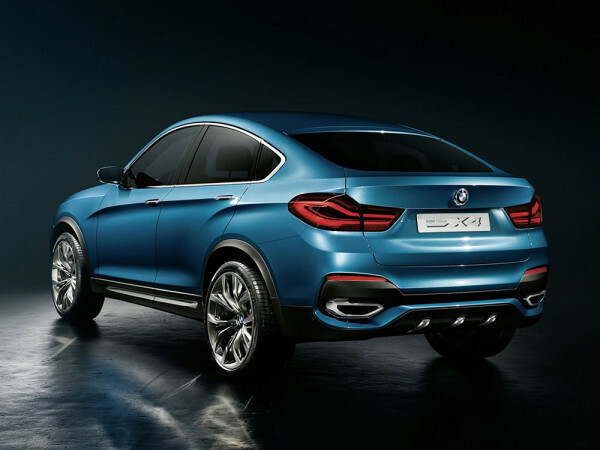 Accordingly, most of the devoted automobile aficionados will be keeping their fingers crossed with the impending showcase of BMW X4 Concept in Shanghai. From exterior appearance, the BMW X4 crossover derives its design cues similar to the elder sibling X6. The Concept version has the same low slung silhouette of BMW X6 luxury SAV and has captured the essence of a saloon in a classy manner. Further, the X4 design depicts a clear design link between the BMW X3 compact crossover and the 4 Series Coupe Concept, and the trio has a common integrated LED pattern in the headlamps that flows nicely into the grille. Speaking of under-the-hood specifications of the BMW X4 Concept, the stunning crossover is expected to share engines with the X3 little sibling, just like X6 shares X5 power mills. Therefore, the BMW X4 Concept could come assimilated with 2.0 litre and 3.0 litre engines rated with peak power outputs close to 180 bhp and 250 bhp, respectively. A top end model of the X4 could also derive its power from a tuned 3.0 litre motor that could churn out peak power around bhp. The drivetrain installed in the BMW X4 Concept is expected to be the cutting edge xDrive system in All Wheel Drive (AWD) configuration. BMW reveals first impressions of the X4 Concept. As per reports, the German luxury automotive marque will be assembling its X4 model along with its siblings X3, X5 and X6 at the Spartanburg manufacturing facility based in South Carolina, United States. BMW is expected to launch the production version of X4 SAV sometime in the first half of 2014 calendar year.